The BOD EVO Sensor is the unique and revolutionary wireless sensor, able to transfer data to the dedicated software BODSoft™. Mercury-free and intuitive, BOD Sensor ensures an outstanding reliability as there is no need to open the door of the incubator thus eliminating the risk of internal temperature variations. BOD Sensor has an extremely compact profile and is easy to handle. The sensor measures the BOD value directly in mg/l with no need of further calculation and the results are immediately sent to the PC. Real time monitoring on the sensor display is still possible. 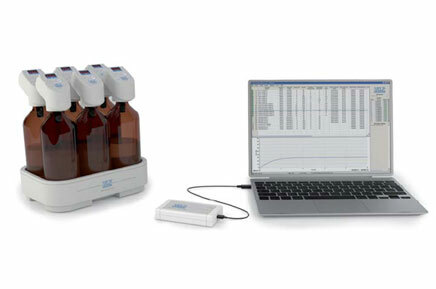 Manufactured using the most modern and advanced construction techniques, the BOD Sensor fits directly on the bottle containing the sample. Measurement is available on 4 different scales - 90, 250, 600 and 999 ppm BOD. Higher values can be measured by diluting the sample. It comes as a package in the BOD EVO Sensor System 6 configuration, including the 6-position stirring station with BOD Sensors, dark glass bottles, alkali holders for absorbing carbon dioxide and stirring bars. The Stirring Station is extremely simple to handle and the VELP stirring quality is guaranteed. The space saving footprint means that up to 5 stirring stations for a total of 30 samples can be placed in a VELP incubator (FOC 225E or FOC 225I) simultaneously. BOD EVO transfers the BOD value to the Wireless Databox™ automatically. The results are shown through the user friendly BODSoft™. An innovative solution to simplify BOD investigations!